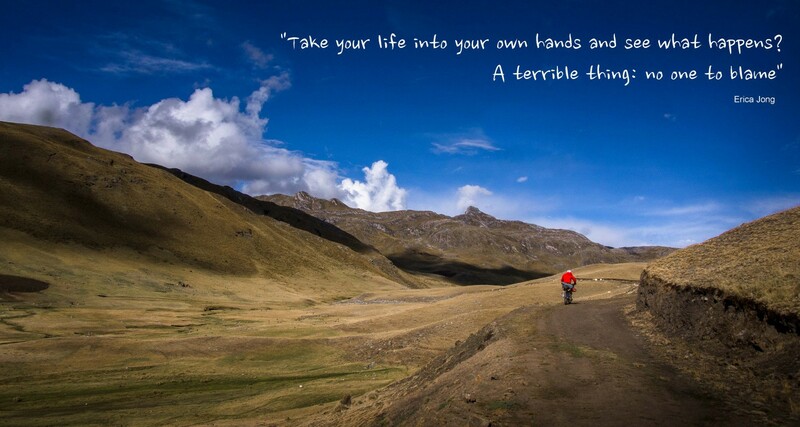 This is a little something I penned out whilst battling through Bolivia and hopefully it may be of some use to future riders, although I fear it probably comes across more as a biased rant… It’s the kind of thing I wish I’d read before I set off on this trip (whenever that was), back when, like almost everyone else, I assumed gearing up for a bike expedition was a case of buying four Ortlieb panniers and stuffing them to bursting point. A valid approach for many, but for some the benefits of breaking the shackles of convention and going ‘lightweight’ are overwhelmingly worthwhile. The ramblings that follow are my attempt to preach the virtues of a lightweight setup and hopefully dispel some of the ‘myths’ that surround it. Here goes…. Mark Beaumont breaking the round the world record in 2008 on a 45kg ish set up, what was he thinking..? 194 days. Ability to tackle off road routes: I wrote this during Bolivia’s Lagunas route, one whose beauty is enough to tempt some of the heavily laden crowd off the tarmac and onto the famed sand and washboard. A tough route at the best of times, which is renowned for being a largely pushing affair on a traditional set up. If you’re determined enough you can drag a heavy bike along almost any route, but the actual level of enjoyment is likely to be pretty minimal. 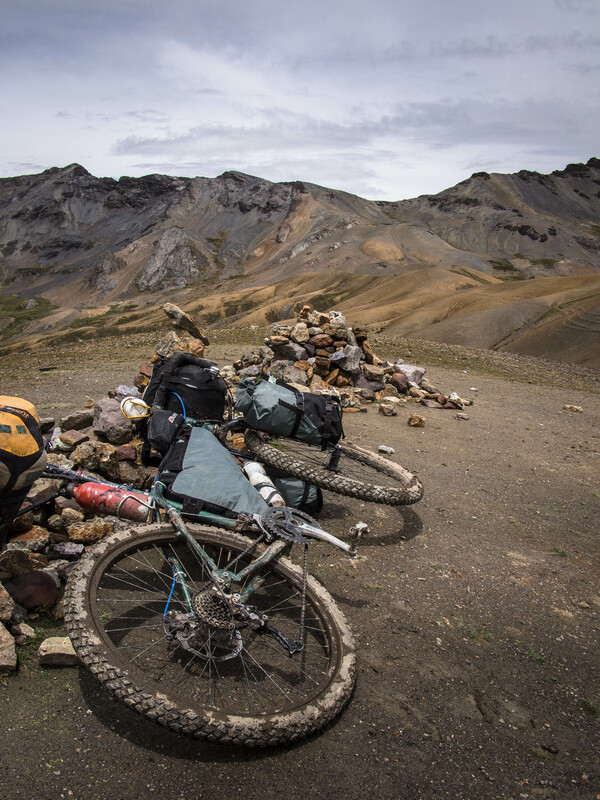 The riding can become a choir and dirt routes, which for me represent the very essence of what Andean biking is all about, can end up being resented and often avoided altogether. With a light rig without panniers bouncing around, you not only have much improved handling due to hauling around less weight, but you can also run much lower tyre pressures without pinch flatting (I’m often down at 20psi, which is nuts). Combined with high volume tyres this makes the ride much smoother, meaning you can fly on dirt roads and handle almost as you would on an unloaded mountain bike, a way more enjoyable experience. Climbing ability: Whether on road or off road, shedding weight makes a huge difference on climbs, whether it’s riding something that you otherwise couldn’t or just going faster. Coming from a cycling background I hate feeling like I’m dragging an anchor up climbs, crawling along unable to put in any real accelerations. Furthermore, the effect is amplified if you’re a light rider like myself (a shade over 60kg), where the effect of lugging more weight up a climb is more significant than for a heavy chap. I may be a dangerous climber on an 8kg race weapon, but put me on a 50kg touring rig and that power to weight advantage is so diluted that a 90kg non-climber with the same setup would probably rinse me. Bikepacking: Whilst most routes are just about possible on a heavy setup, the more involved Andean bikepacking routes are not, things like Ausangate, Huayhuash and Rajucolta. These often involve carrying the bike for long stretches and then tackling technical singletrack descents, something that isn’t going to happen on a four-pannier behemoth. Component wear: A lighter load means you bike takes less of a battering, especially off road, and as such you can get away with running a lighter set of components or simply not worrying as much about things breaking. ‘Fast and Light’: Riding light means you can go faster and cover more distance in a day, which can have big advantages in more remote areas (see below). With a heavy rig you tend not to be able to cover as much distance each day, especially when tackling off road routes where the difference between ‘slow and heavy’ and ‘fast and light’ can be considerable. In more remote areas this means that whereas a light rider could make it from one water source or food resupply point to the next in one day, the rider with a heavy setup may need two. As such he or she needs to bring significantly more water, probably in the region of 5 litres for a hot place, which equates to an extra 5kg of baggage. Combined with the extra food this makes a heavy setup even heavier, making the riding even more of a challenge and slowing progress further. This is illustrated brilliantly again by Bolivia’s Laguna route where a heavy weight tourer taking around 10 days has to carry significantly more in the way of water and supplies than I did by going ‘fast and light’, blasting between water sources and doing it in half this time. Thus the very tenuous ‘chicken and egg’ link, what comes first; the heavy setup (bombproof bike, racks, panniers etc) required to carry the large amount of supplies or the large amount of supplies itself…? 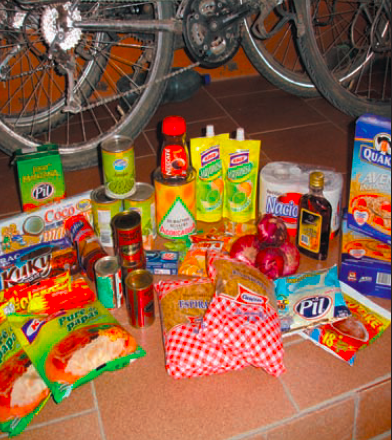 An example of the food typically lugged along Bolivia’s Lagunas route (taken from the TKguide), this is a lot…. When I run into other cyclists I’m generally met with mild outrage when they see the bike, as if I’ve somehow cheated the system; “Where is everything?” “How is this even possible??”. If the truth be told, my packlist isn’t exactly extreme, it’s just been carefully honed to what I know I absolutely need to enjoy the trip and then it’s simply a case of some rather precise ‘stuffing’ to get everything to fit in. Bags and support systems: Two Tubus racks, four Ortlieb Classic panniers, bar bag and medium Rack Pack weighs about 6.5kg, and that’s before you’ve actually packed anything. A complete pannierless bikepacking bag system is probably more like 1 to 1.5kg in total. Food and water carried: To borrow a phrase from the engineering world, I operate on a ‘just in time’ basis instead of hording. More often than not I carry no food apart from tea/coffee/sugar and just one full water bottle when I know there’s plenty of places to refill. I’d say most tourers carry way more water and food than they actually need. Why pay hundreds of dollars to save a few grams on kit then carry 3kg more water than you need….? Clothes: These are bulky and surprisingly heavy; really to travel light you have to be pretty strict when it comes to clothes. My strategy is all about layers, so that you’re basically wearing everything you have when it’s cold. Lightweight camping gear: Now it gets expensive; high fil down sleeping bag, ultralight tent, lightweight mat with air insulation. eBay or outdoors forums are great for finding barely used top end gear cheaply (my last two tents came from here) and can be a great option if you’re on a budget. Else try to get companies to sponsor you. Spares and tools: You can carry spares and tools for every eventuality, but they weigh a lot. Ultimately it all comes to what level of risk you’re willing to live with, but to be light you’ll need to accept that you can’t bring everything. I’m probably one of the most minimalist when it comes to this area and have been progressively throwing stuff out, riding without a spare tyre for the past 6 months. Kitchen: I’m now a beer can stove convert, which basically weighs nothing and doesn’t take up much space. One cheap aluminum pot is really all you need for cooking unless you’re gourmet. Misc items: Don’t give up what really matters to you; Matt has his guitar, I have camera gear and a MacBook Air for editing, work etc. Just ask yourself if you’ll really miss it? Chances are you won’t, even when you think you will. Lightweight riding generally involves taking more risks, whether it’s carrying the bare minimum of water, spares or first aid, so if you’re particularly risk adverse and like to be prepared for every eventuality then lightweight may not be for you. i am mortified and removing my front racks asap. completely unnecessary. I backpack using ultralight techniques that transfer directly to bikepacking. I still like to use racks, but a couple light dry bags will haul the same amount of gear as my multi-day backpack. Indeed, loading yourself down with four panniers full of gear makes no more sense than hiking with a massive backpack overloaded with redundant gear. 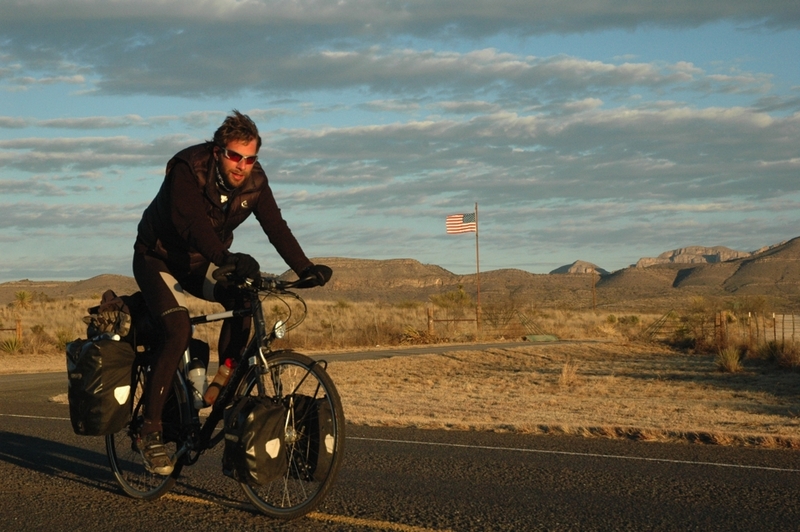 The only difference in a backpacking kit should be bike specific tools and those should be as light as possible too. The base weight for my hiking kit is 4-6kg, plus water/food/fuel. There are many who hike with sub 2.5kg kits. It can be done! Hi Dale, the backpacking world is way ahead when it comes to ‘fast and light’ like you say, but things are starting to change, albeit slowly. 4 to 6Kg is pretty impressive. 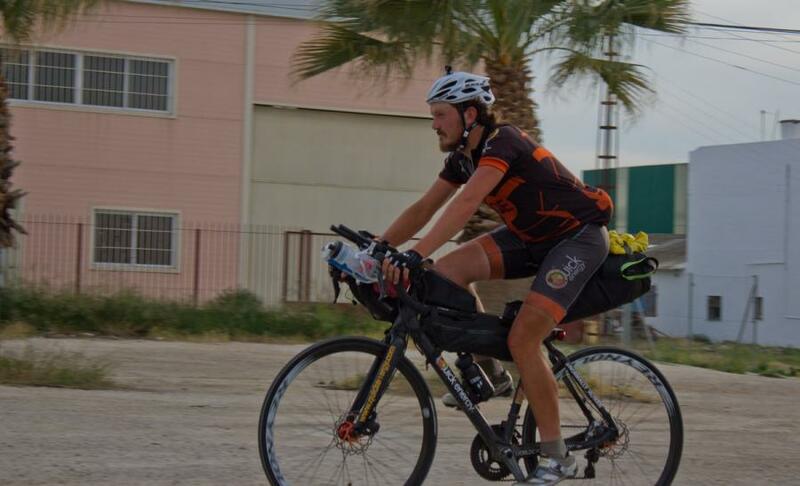 like your fork leg ikea bin combo, the great thing about bikepacking is that it’s still in it’s relative infancy and there’s loads of scope for innovation. Always good to read your posts. 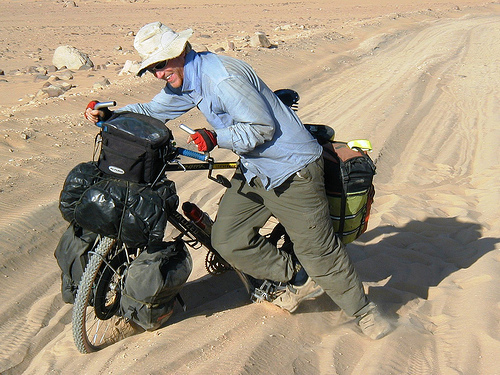 Yeah, I agree, it’s pretty straightforward to travel lightweight in easy countries like Bolivia and Peru, but when it comes to really challenging routes such as the Canning Stock Route or crossing the Simson Desert in Australia, lightweight is not an option. And relying on JIT water management there means they will be collecting your bleached bones before long! In other words, there is no perfect setup for all conditions and regions. Most of the people on that list have carried a load of panniers at one point, and do not necessarily come from mountain biking. 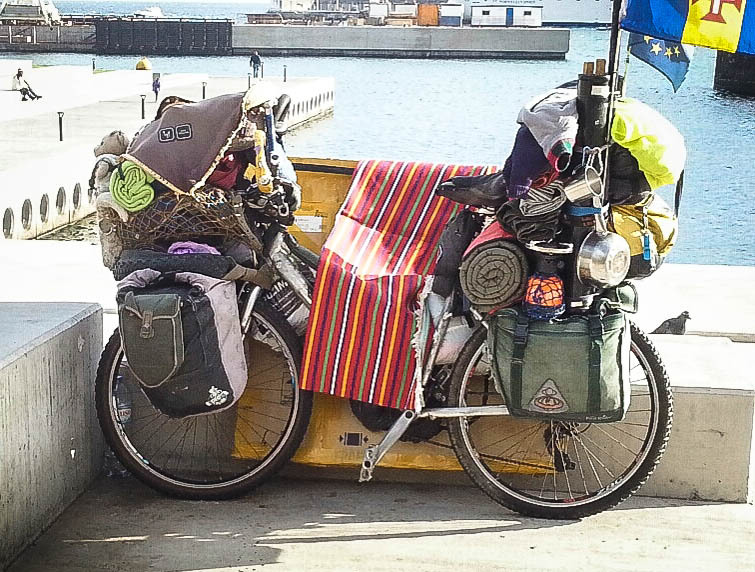 I carried four panniers once, but they were half empty and I couldn’t figure out how to fill them. Ok sounds like that was a bit presumptive of me then… We all have to start somewhere before finding our grove, it wasn’t long ago I was in the four pannier club…! Hi. Whilst I generally applaud taking to the road in as lightweight fashion as possible…. I get lost on the get there as fast as possible mentality. What’s the hurry? The trip is the magic. Take it easy, stop often. Chat with locals, take great pictures. Stay a while, read books, sketch or write in your journal. Annnd when ready on for more travel. Yes you can do all this in the next town but really it’s likely that you rode past amazing spots just to get there. Indeed, a light setup makes for less grinding en route but what’s the point if you left your book behind? Hmmmm, each to their own.